The vivid colours of the sunrise add to the beauty of the skyline in the City of Sydney in NSW, Australia. The appealing city of Sydney sits under a vivid sunrise in colors of blue, red and gold. The city of Sydney's skyline with its high rise buildings include the tall thin Centre Point Tower in the far distance and the Anzac Bridge in front spanning the Johnstons Bay between Pyrmont and Glebe Island. This image belongs to the travel and nature stock photo library. This stock photo of Sunrise over Anzac Bridge is available for licensing for commercial and editorial uses including websites, blogs, books, magazines, brochures and advertising. Restrictions may apply for images which contain third party copyrighted material or sensitive subjects. Photos of artwork are for editorial use only. 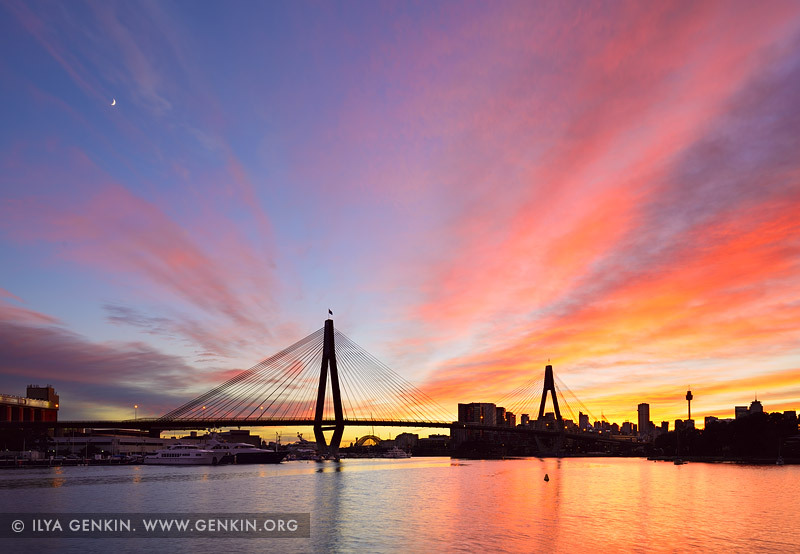 This image id AU-SYDNEY-ANZAC-BRIDGE-0013 of Sunrise over Anzac Bridge, is copyrighted © by Ilya Genkin. This is not a public domain image.